As its Aztec name (comalli) suggests, the Comal has its roots in Mexico since Ancient times, however they are also widely used throughout Central and South America. It is an essential tool used in many applications such as in preparing tortillas, toasting spices, and roasting vegetables. They are also used to sear meat, and prepare recipes such as quesadillas. In many Hispanic households, the Comal are handed down from generation to generation as family heirlooms since they become seasoned over the years. Most Comals sold in the United States are made of Cast Iron, but these are authentic clay Comals made with natural untreated clay (comal de barro) and coveted for their slow heat distribution. With use, the Comal becomes seasoned and like cast iron skillets or woks, they give food that little extra hint of flavor. A clay comal is very fragile and can break in not taken care of. Be careful when moving it, or washing it, and make sure not to hit the sides against any objects. 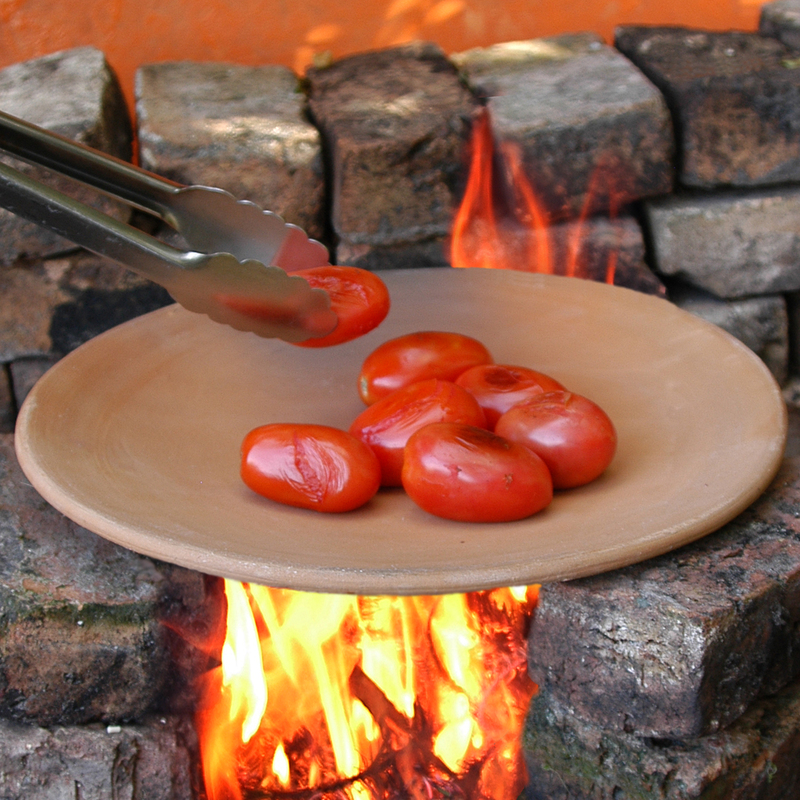 A clay comal can be used on a stove top, both gas or electric, direct flames or if you wish, an oven or microwave. If you use an electric range, it is recommended to use a heat diffuser as it has the benefit of distributing the heat slowly to prevent foods from burning. A clay comal can be used on an induction cooktops however, it needs to be used with a induction cookware interface disk. As with any clay or glass cookware, a clay comal must not be submitted to drastic changes in temperature. The comal should be allowed to slowly adjust to heat, letting it slowly heat up until they are hot. Likewise, always allow the comal to cool to room temperature before washing or storing it, and never set a hot comal on a cold surface such as granite or tile. To clean a clay comal, you can wash it by hand with warm soapy water. Never put a clay comal in a dishwasher, not only can it absorb some of the soap taste, but since it is so fragile, it can break. If heavily soiled, you can soak the comal in warm soapy water and allow it to soak briefly, then scrubbing lightly with a sponge or soft cloth. Never use metal or abrasive cleaners, and always try to avoid strongly scented soaps which can flavor the clay. As with most products which are handmade by artisans around the world, the comal may have slight imperfections in the form or finish of the materials, or on the glazed designs. Sometimes sizes of same model may also vary slightly, however, these imperfection do not compromise the aesthetics or functionality of the piece and are considered normal and expected. Before using a Clay Comal, it must sealed and seasoned to prevent food from sticking, especially tortillas. To season it, put the comal over low heat and slowly bring it up to temperature. Prepare a watery mixture of dry lime (cal) and water and spread a thin layer of the mixture over the entire surface of the comal using a dry towel or brush. Heat it until the lime mixture dries and hardens. Once cool, rinse the comal, and repeat the process. The comal is now ready for use. Dry lime is a chemical lime in the form of Calcium Hydroxide (aka Edible Lime, Hydrated Lime, CaH2O2). It is common in some food processing in Latin America, and has been for millennia.